During Tuesday night’s match against W.T. White, Coppell High School senior forward Nick Taylor (left) and junior forward Francisco Redondo (right) celebrate after scoring a goal. Coppell defeated W. T. White with a final score of 4-1 at Buddy Echols Field. With under a minute to play in the first half of Tuesday night’s match with W.T. White, Coppell senior midfielder Alex Haas lined up to take a free kick from the 33 yard line. He launched the ball, putting it on frame, as he often does. The shot sailed over an unexpectant Longhorn keeper’s head, giving the Coppell boys soccer team its first lead of the night. Haas’s goal not only marked the one-goal lead that the Cowboys would never rescind, but it denoted a major shift in play. Confidence abound, Coppell went on to defeat W.T. White. 4-1, at Buddy Echols Field. 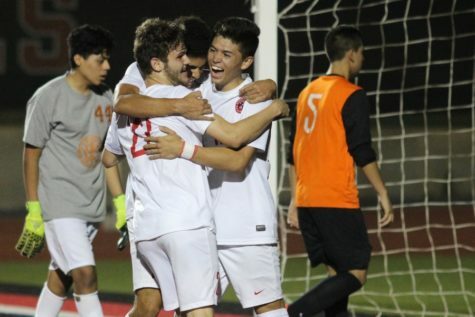 Coppell High School senior forward Jacob Capdevila, junior forward Francisco Redondo, and senior forward Nick Taylor celebrate after Taylor scored the fourth and final goal for the Coppell Cowboys during the second half of Tuesday night’s game. The Coppell Cowboys ended the night with a 4-1 victory over the W.T. White Longhorns at Buddy Echols Field. The first half was a bit of a struggle for the Cowboys (11-2-1 overall, 9-1-1 District 9-6A). They were unable to control the ball, making poor passes and not creating in the final third. Yet it was Haas’s goal, along with a rejuvenated second-half team, that really was able to get the team going. In the second half, Coppell looked almost like a different attack from the start. Passes were crisper, combinations were cleaner. CHS junior forward Wyatt Priest took advantage of a ball in the box and scored, giving the Cowboys a 2-0 lead in the 44th minute. The letting of the proverbial foot off the gas came back to bite them, as W.T. White (7-7-2, 6-5-0) found the back of the net only five minutes after Priest’s score. 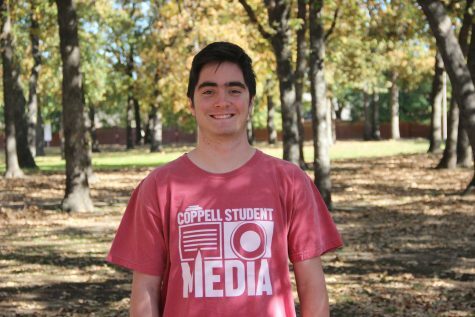 Yet, it was junior forward Kiko Redondo and senior forward Nick Taylor who scored two insurance goals following the Longhorns’ goal, solidifying the win for Coppell. After Jesuit lost, 1-0, to Richardson Pearce on Tuesday, the Cowboys are deadlocked in a tie for first place in District 9-6A with five or six matches to play, pending tournament results. 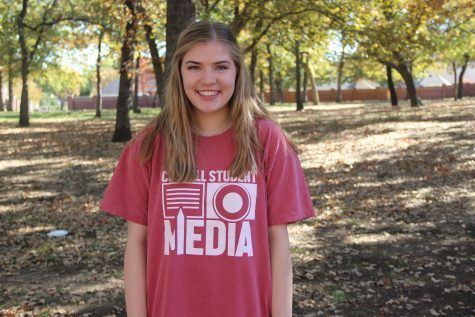 In the final three district matches of the year, Coppell will play Richardson Berkner, Skyline and Richardson, three teams it has already defeated handily earlier in the season.